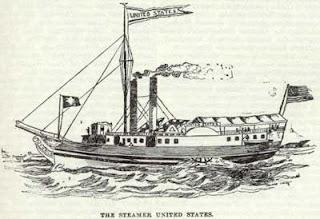 Under Birge’s unsanctioned battle plan, unarmed men were to board the passenger steamer United States in Oswego on November 9 before it set out on its usual route to Ogdensburg. Other men would board the steamer at each town as it followed its schedule to Ogdensburg, the American town directly across the river from the attack target, Prescott, Upper Canada. With his orders given, General Birge departed for Ogdensburg ahead of the steamer to organize more men in that town. British spies in upstate New York, some within the Hunter ranks, were sending regular reports back to military authorities in Canada. It was clear an invasion was underway but the exact landing point was still speculative. John Colborne, 50, commander-in-chief of British forces in the Canada, alerted all militia and regular army units to be on the ready. On November 10, Heley Chamberlain, a Hunter spying for the British, told Captain Williams Sandom about a Hunter force bound for Prescott. Sandom, 53, naval commander on Lake Ontario and a veteran of 60 naval engagements, ordered armed steamers to patrol the lake and St. Lawrence River. No fool, Captain Van Cleve suspected the newcomers were Patriots or Hunters bent on making trouble. He refused to leave port. One of the ship’s owners, on board and bound for Ogdensburg, overruled him. In his memoirs, Heustis recalled his conversation at Sackets Harbor with Colonel Woodruff when they realized they had just 180 men and only five of the promised 500 Poles.